A recent survey conducted by Reach Health on the status of telemedicine initiatives at healthcare organizations identified that these programs are evolving from specialty offerings to mainstream services. Survey participants represented a broad mix of healthcare organizations. More than half of the 436 respondents were from teaching hospitals or systems, with just over a quarter from non-teaching hospitals or systems and slightly over 10 percent from physician practices. Around a third (31 percent) of the organizations have revenues of $1 billion or greater, 21 percent have revenues between $50 million and $1 billion, with just under half (48 percent) at the low end of the scale with under $50M in revenues. Patient-oriented objectives including improving patient outcomes, improving patient convenience, and increasing patient engagement and satisfaction were the most common objectives for telemedicine programs. Reducing the cost of care also ranked consistently high across objectives. 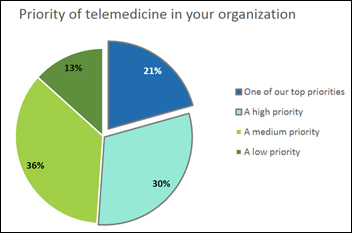 The overall priority of the telemedicine program at an organization, as ranked among other provider priorities, had a strong correlation with success. Telemedicine programs with a dedicated program coordinator or manager are also 20 percent more likely to be highly successful. Reimbursement, both government and private, continues to create the most significant obstacles to success, accounting for the top four unaddressed challenges to telemedicine. Challenges related to EMR systems also create significant obstacles to success, accounting for three of the next four unaddressed challenges. Interoperability and integration issues continue to pose significant challenges. Telemedicine platform features were rated by respondents based on their value to an organization. Three of the top six platform features were related to telemedicine data, including clinical documentation, ability to send documentation to/from the EMR, and ability to analyze consult data. All of these features were rated as critical or valuable by nearly 80 percent of respondents. Over half of participants indicated their telemedicine platform was primarily purchased or licensed from a vendor. In general, larger organizations are more likely than smaller organizations to build systems internally. However, the survey results indicated that the mix of build vs.buy is highly consistent across the spectrum of organizational sizes. Two-thirds of the survey participants indicated their telemedicine solution is a standalone system, and not integrated with their EMR system. Only 10 percent indicated their EMR system serves as their telemedicine system. This is beginning to change as vendors improve integration capabilities, but not rapidly. Over the past three years that the survey has been conducted, there is a clear transition toward enterprise level programs instead of departmental initiatives. A key driver is improving ROI with several primary motivators, including improving patient satisfaction, keeping patients within the health system, securing reimbursement, enhancing the reputation of the organization, and increasing provider and staff productivity. Activity has increased across the board and for all settings. However, active E-visit programs grew by 40 percent in 2017 and general practice initiatives also showed strong growth. Maturity levels of programs vary. Service lines requiring access to specialists, especially those in increasingly short supply, are maturing more rapidly than the more generalized service lines. Over 70 percent of the survey participants operate telemedicine programs within the boundaries of a single state.